Bernie Sanders, Vermont’s pseudo-socialist senator, thinks that America can learn from Europe. But he’s also wrong. That’s because he thinks that Europe is a role model to emulate rather than a warning signal of mistakes to avoid. Needless to say, that’s borderline crazy. Heck, even President Obama has pointed out that the United States out-performs our European counterparts. In his Washington Post column, Robert Samuelson warns that it would be a mistake to follow the European model of more taxes and additional regulation. He starts with (what should be) an obvious point about businesses responding to incentives. We can learn from Europe about job creation, but many Americans may reject the underlying lesson. It is: If you price labor too high — pay workers more than they produce — businesses will slow or stop hiring. He then points out that bad incentives in Europe are leading to bad results. Europe’s economy is in the doldrums. Growth in the eurozone (the 19 countries using the euro) is weak… Eurozone unemployment is 11.1 percent, barely down from the peak of about 12 percent. This contrasts with the United States, where the jobless rate has dropped from 10 percent in October 2009 to 5.3 percent now. And what exactly are the bad incentives in Europe? Simply stated, governments are imposing too many burdens on the economy’s productive sector. Which brings us back to the point Samuelson made earlier. If the costs of new workers exceed the likely benefits in higher sales and profits, companies will hire less or not at all. And just in case the implications aren’t obvious, he spells it out. …we should not ignore the implications for the United States. …it’s tempting to load the costs of social policies onto business. …The Affordable Care Act (aka Obamacare) requires firms to provide health insurance for workers; a $15 minimum wage would raise labor costs sharply for many firms; and there are proposals mandating paid maternity and sick leave. All these seem worthy causes, but we need to be alert to unintended consequences. If we make hiring too expensive, there will be less hiring. Amen. As I’ve already noted, businesses aren’t charities. They won’t hire new workers if that means lower profits! But Europe has a lot of these policies, so unemployment is higher. And we have politicians in America who want to copy Europe’s mistakes. The problem is not just that politicians are making it more expensive to hire workers. Bad government policy also is making it more expensive to do almost anything. The U.K.-based Telegraph has a story looking at how some European governments are making other business activities needlessly costly and difficult. …doing business in Portugal, Ireland, Italy, Greece and Spain is more difficult, expensive and slower than in stronger, neighbouring countries. 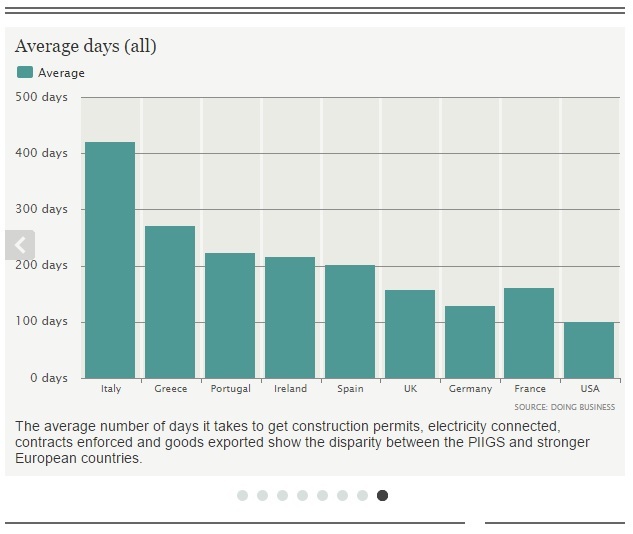 …Looking at the average time it takes to get construction permits, electricity connected, contracts enforced and goods exported shows the disparity. This chart shows that the problem is especially acute in Southern Europe. Let’s close by making a very important point about differences within Europe. While it’s sometimes useful and interesting to look at big-picture comparisons (such as average unemployment in the EU vs US or average income in the EU vs US), it’s also important to realize that European nations (notwithstanding pressures for harmonization, centralization, and bureaucratization from the European Commission) still have considerable leeway to determine their own economic policies. And if you peruse Economic Freedom of the World, you’ll see that Northern European nations such as Finland (#10), Denmark (#19), Germany (#28), and the Netherlands (#34) are all considered market-friendly, while Southern European countries such as Spain (#51), France (#58), Italy (#79), and Greece (#84) are much lower in the rankings. The Nordic nations are especially interesting. They have large welfare states, but they have very pro-market policies in other areas. So to elaborate on what Senator Sanders asserted, we actually could learn some good lessons from Scandinavian nations in areas other than fiscal policy. P.S. Since we picked on Bernie Sanders already, let’s create some balance by also mocking Hillary Clinton. Here’s a clever satirical video about her email scandal. And if that doesn’t satisfy your craving, click here for more Hillary humor. It would be nice to have the option to post this column on Facebook. I am tired of all the Bernie Sanders posts from my “progressive” friends. I really cannot see how making a continent that has a structural 0.5-1% annual growth trendline could possibly lead to anything but decline and marginalization into obscurity. With a structural growth rate that is less than a quarter the world average, nothing is sustainable. Nothing. But apparently the idea seems so great, so primordially irresistible to the voter-lemming, that humanity must make an Nth attempt at prosperity through mandatory compassion and central planning. All previous attempts have sacrificed themselves only to prove the same failure. Now it seems Americans are volunteering to be the Nth guinea pig in this repeated failed experiment. Forced higher costs will simply drive American companies to be overtaken by the much much bigger universe of international competition. Not only will they stop hiring. They will also start laying off current workers. Ironically that is what the U.S. has traditionally done to the rest of the world. Eliminated their international competitors through the lower cost of less mandated benefits and the higher motivation of their workers which stem from steeper effort-reward curves. And this is how the American middle class ended up in the world’s top 3-5%. And while international middle classes may have been out competed in the short term, humanity and future generations have derived enormous benefit from American high growth. A growth that for nearly s century and a half outpaced average world growth. But now that Americans have finally tugged the European Trojan horse of unconditional welfare past Ellis Island, they’re quickly undoing all that. There is no return from this point folks. American growth has already slowed down to less than half world average. The natural order of things going forward is for voter lemmings to react to the malaise effects of low growth with more redistribution, more central planning (ie more majoritarian collective control of the economy), more Europeanism. American prosperity, the days of the American middle class being in the world’s top 5%, has crossed the rubicon. A $15 minimum wage, healthcare, maternity, and sick leave are not a problem for companies that deal with the liberal elite, like a law firm or a lobbyist. However, they kill small businesses that deal primarily with the poor. Such legislation creates a double whammy, because the poor not only lose jobs in these small businesses, they lose the products or services that these companies would otherwise provide at reasonable prices. Reblogging for future reference. Be sure to read to the end (not the video, but the parts about the pro-market European countries).